So as I posted in an earlier post, Matt has this deep love affair when I make Banana Chocolate Chip Muffins. It’s quite ridiculous, actually. If I make a dozen, they’re sure to be gone within 24-48 hours with no exceptions. Mind you, this is 12 muffins. TWELVE. I would be lucky if I get at least one to try and even then Matt jokes that I only left him less than a dozen. As luck would have it one day, I had super ripe bananas sitting in the fridge. The cold tends to help keep the bananas in their ripe stasis. And while I would normally just make plain banana chocolate chip muffins, I decided to try out a little chocolate experiment. Now, I make these brownie cookies that are downright sinful (but absolutely delicious). To that recipe, I usually add cocoa powder to give the batter this great chocolaty consistency. 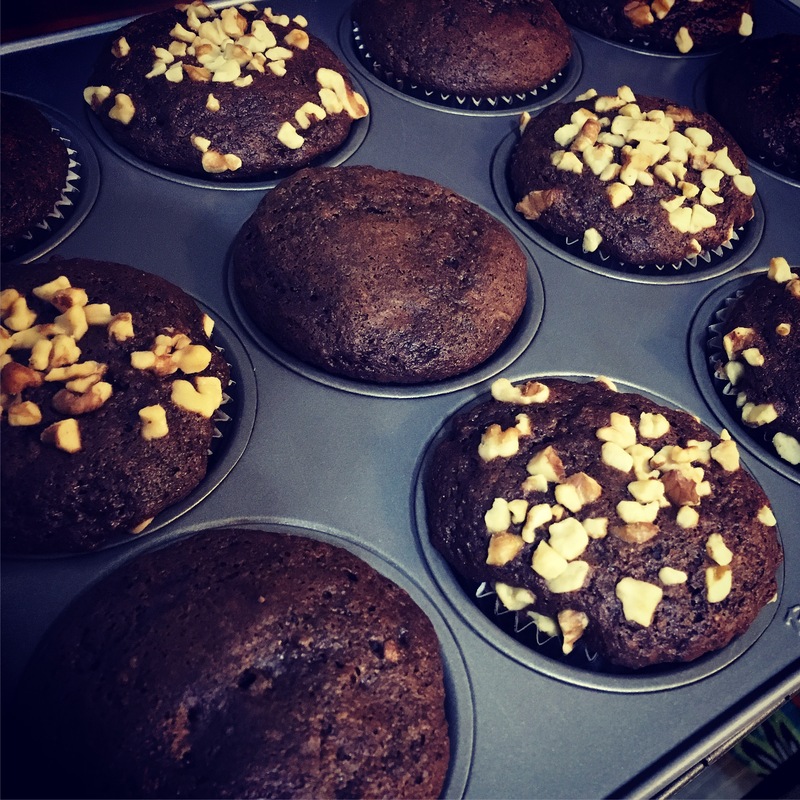 Since Matt already loves that my muffins have chocolate, why not use some cocoa powder and make them double chocolate banana muffins? When using cocoa powder, the easy way to incorporate it into a mix without drying out the muffin is to adjust the amount of flour. For example, my recipe calls for 1 1/2 cups flour. If i put in 1/4 cup cocoa powder (which I did), then you only use 1 1/4 cups flour. It’s really that simple. The result ended in Matt mentioning how the cocoa powder took a little bit of the banana flavor away, but made it almost like a muffin/cupcake hybrid. I think my next cooking endeavor might be to add a cream cheese frosting to this. Or if I’m daring, possibly Rum Chata frosting could be an interesting twist. For my original post about muffins so you can try out this recipe, click here: A muffin a day makes a happy husband!